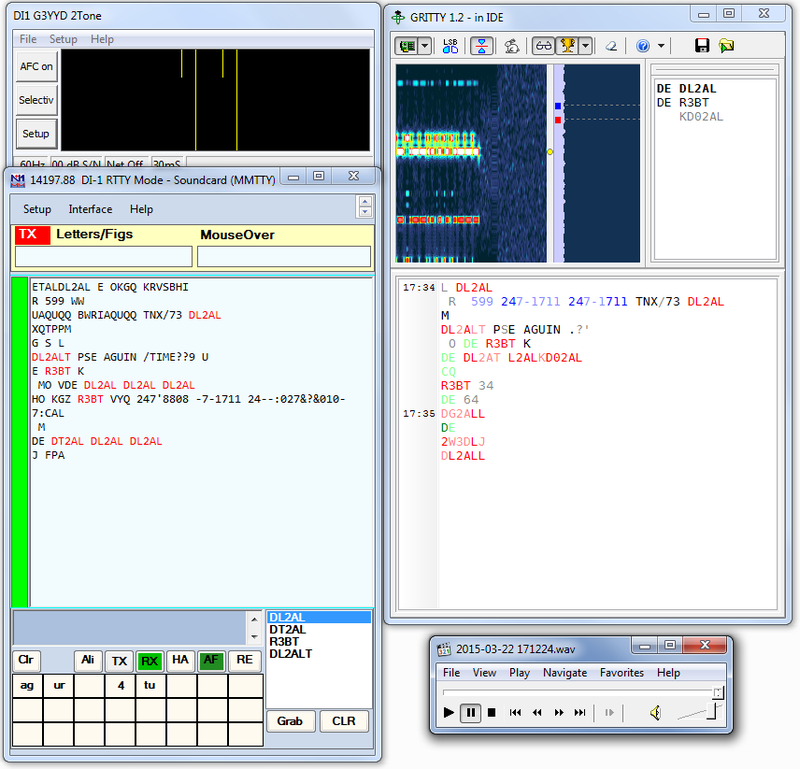 GRITTY is a new generation RTTY decoding software, it differs from the traditional decoders, such as MMTTY, TrueTTY, MixW, FLDigi, 2Tone and others in several important ways. To illustrate these differences, I made a few audio recordings of RTTY signals, played them back via the VB-Audio CABLE, and decoded them with GRITTY. The screenshots showing the decoded text are provided below. 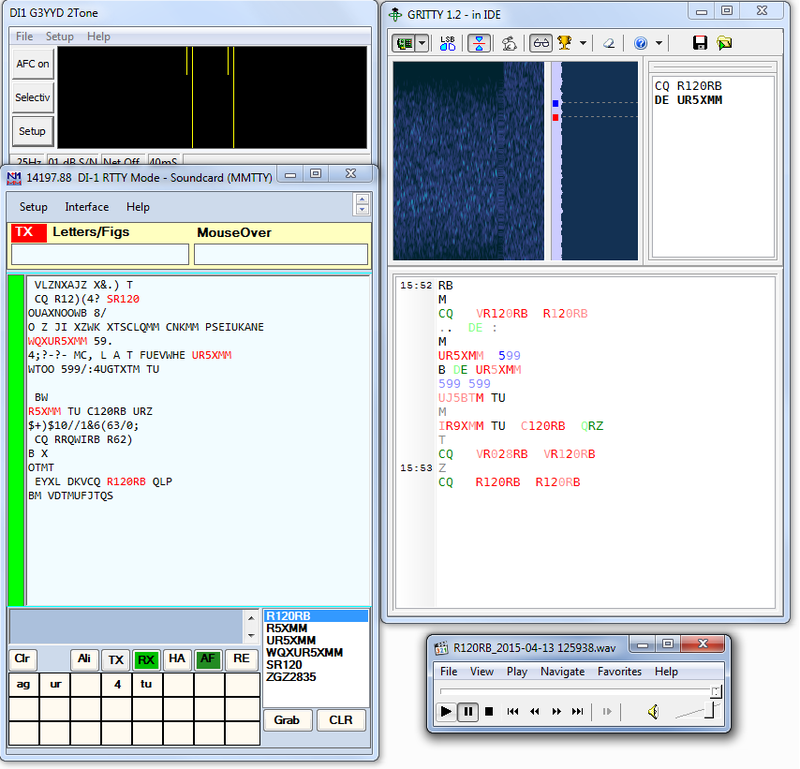 The text decoded with 2Tone, the current state of the art decoding software, is also shown for comparison. The audio files are also provided, feel free to download them and do your own tests. SX150ITU is calling CQ. When the signal is strong, GRITTY copies the same text as most other decoders. The only difference is that GRITTY prints much less garbage during the silence intervals, due to its statistical squelch algorithm: the text is printed only when the probability of error is low. For best results, use a 3-kHz filter in your radio. Narrowband filtering, even with an 1.4 kHz filter, makes squelching less efficient. II1SAP is calling CQ. 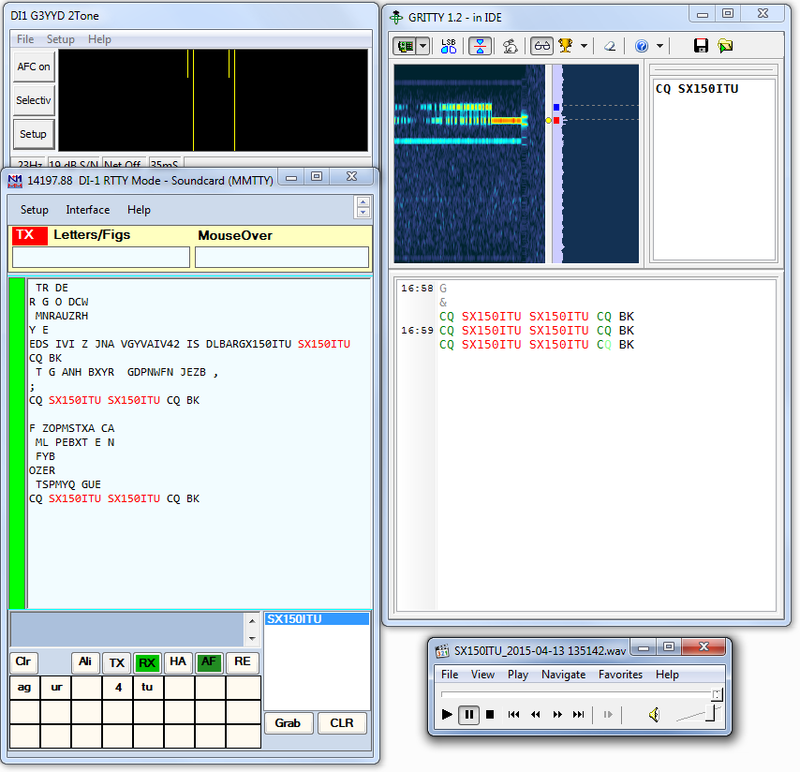 The signal is strong, but there is no such thing as QSB-free signlals on HF, and this one is not an exeception. One of the QSB nulls has killed the space between the words in "SUBMARINE ANDREA", another one corrupted the word "QSL". GRITTY made these errors, but it highlighted the unreliable characters with a light color, to help you identify possible errors. R120RB runs on this frequency and works UR5XMM. The signals are weak, with deep QSB, and GRITTY makes errors in the decoded text, but it still captures all callsigns due to its post-processing algorithm that knows the structure of a typical DX or contest QSO. All errors in the copied callsigns happen to be marked with a light color, which makes your guesswork easier. Now look at the callsign stack window. Even though most of the decoded callsigns have one or more errors, the call stack contains only the valid calls. Moreover, it also indicates that R120RB is runninng ("CQ"), and UR5XMM is calling ("DE"). This recording was made by one of the beta testers during the BARTG contest. Multiple signals in the receiver passband do not prevent GRITTY from doing its work. This is another recording made in the BARTG contest. The signal is heavily clipped in the receiver. 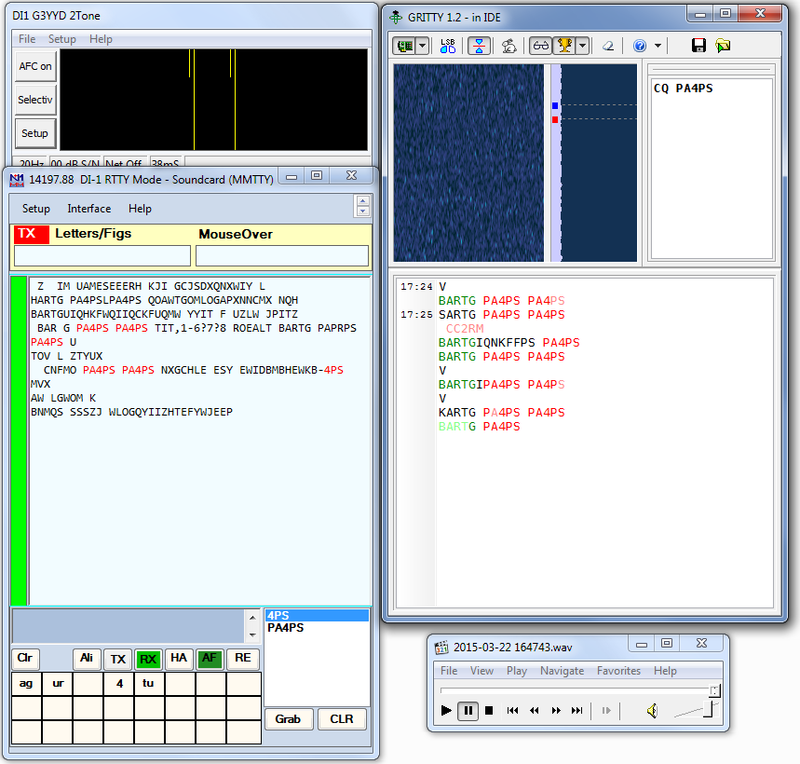 2Tone decodes better in this example, in particular, it prints more copies of station's callsign. Despite having difficulties copying this message, GRITTY still identifies the correct callsigns and shows them on the call stack. It also shows one incorrect call, KD02AL, but this call is printed in light gray, an indication that it is probably incorrect. The exchange number that appears in this message is printed in blue. GRITTY knows the exchange format in this contest and does its best to find and print exchanges. 2Tone did not print this exchange, even though it did a better job copying the text. Without post-processing, GRITTY would not pick it up either, but it noticed a sequence of letters that, if changed to the LTR shift, would form a valid exchange, and corrected the shift error (the actual algorithm is more complex, it works with individual bit probabilities).